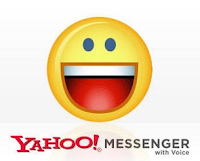 Yahoo Messenger hosts a lot of wonderful features you’d find in a typical Instant Messaging program that it can be used to do more than just IM with your friends. Yahoo! Messenger 10 is fully integrated with mobile devices so that you can continue the conversation on your phone even when you’re away from your PC. And with the new “Updates” view of your contact list you can always know about your friends latest activity online. You can see what your friends are sharing on Yahoo!, Flickr, Twitter, MyBlogLog, Yahoo! buzz, stumble-upon and many more.